Oak is extremely durable as a tree type proved by the fact that if you look at a 200-year-old oak flooring the only visible sign of its age could be its colour getting richer thus giving you that extra old posh feeling. Parquet installation can be made floating and glued down and thanks to the tongue and groove the blocks should be easier to fit without unnecessary movement. If you want to reduce the noise on walking on top of the wood flooring think about a floating installation with a layer of underlay underneath. 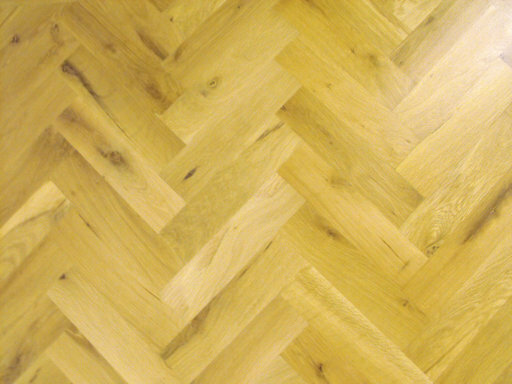 This oak parquet blocks come in rustic grade with colour variations and the presence of knots on the surface of the wood both classified as 'defects' for the wood that gives it a natural feeling. It has measures of 20 mm thickness, 70 mm width and 350 length. Have your floors installed for your for only £00.00 excl. Vat, based on the Packs specified above. Offer is excluding of Underlay and mouldings and other services. Unfinished products will require additional sealing & finishing service, not included in this quote. Our Final Quotations come with 2 Years Service Guarantee and are subject to an Obligation free site visit (currently London areas only). Smaller sized areas (below 15 sqm) will be subject to a minimum charge.